STOP PRESS – All places on this course are currently taken (as of September 2018) so the payment buttons have been removed. Would you like to work with your own birth chart as a learning tool, to discover more about yourself, your potential and the practice of astrology at the same time? Would you like to work with me as your tutor, guide and mentor, to unlock the wisdom messages in your birth chart? Are you interested in learning more about the application of intuitive astrology to your everyday life? Would you like to know more about reading a birth chart but just don’t know where to start? Or perhaps you know a bit about astrology but want to take your knowledge deeper and unlock the more profound truths of your chart and those of your loved ones? If you answered ‘yes’ to any of these questions, my astrology course could be just the thing for you! Needless to say, I have a deep love of astrology and a profound gratitude for its presence in my life. Learning how to read a natal chart many years ago changed my life and it can do the same for you too. The insight and wisdom available in our birth chart is truly breathtaking once we know how to decode it. The lines and symbols that form an astrological chart reflect the patterns and order of the universe as it impacts us in our everyday lives. Our birth chart reveals our personality and psychological makeup, our spiritual path, the qualities we need to develop and those we need to let go, our strengths and challenges, gifts and graces; the people in our lives, the person that we are and who we can become. One of the most frequent comments I hear from my students is that they simply didn’t realise how in depth a birth chart is and the amount and specificity of the information it provides. The common perception that astrology just divides the population of the planet into twelve rudimentary personality types according to the twelve signs of the zodiac couldn’t be further from the truth! Your birth chart is a unique reflection of you. Even twins have differences in their birth charts. Astrology provides such personally accurate and nuanced information that there’s no aspect of ourselves and our lives on which it cannot speak. All we need to know is where and how to look. This course will provide you with the knowledge and skills required to work in an informed and intuitive way with your own natal chart and those of your family and friends. Furthermore, participation in this course will assist you in the development of self-awareness and understanding, and will contribute dynamically to your personal and spiritual growth. You’ll find it stimulating, inspiring and a catalyst for deeper insight into yourself, your life and your potential. You’ll learn about astrology primarily through the study of your own chart, decoding and demystifying its wisdom messages for you along the way, bringing the study of astrology alive and immediately applicable to your everyday life and experience. There are many ways to practice astrology and countless ways to apply its wisdom. From medical astrology to financial, from event prediction to event planning, from relationship astrology to political astro-analysis, astrology has been used and applied in virtually every area of life at some point in the history of human kind. These days, one of its most popular uses is as a tool to support our personal and spiritual development. Used in this way, it reveals in detail the nature of our psyche, personality and spiritual path from cradle to grave. Being able to read a birth chart in this way gives access to the most profound and personal wisdom. It is akin to discovering a spiritual guide who knows us inside out, better than we know ourselves, and who shares with us their insight – guiding, shaping, challenging and supporting us as we go. There are also as many ways to practice astrology as there are, and have been, astrologers. Each brings their own strengths, insight and wisdom to their application of astrological knowledge. Whilst the common ‘cook book’ approach to astrology is frequently used to create off-the-peg interpretations of particular planetary placements and astrological phenomena (e.g. everyone with Mars in Aries will be aggressive, everyone with Venus in Pisces will be sensitive), it fails to create a cohesive whole that reflects the essence of the individual in question. In effect, it lacks the ‘beating heart’ of a natal chart which reflects the life force that courses through the individual born at the very moment of the cosmic configurations it contains. When we approach a chart from an intuitive perspective we allow that beating heart to speak to and through us, enabling the interpretation to reflect the wholeness of the individual, not just the placement of their Saturn and its relationship to Jupiter! Yes, their Saturn/Jupiter square will be significant, but it doesn’t exist in a vacuum. When we bring an intuitive approach to the birth chart, encompassing all it contains in its complexities and paradoxes, we can truly get to the core, the very essence, of who that person is and how they can best live their life in this moment. Throughout this course you’ll be encouraged to do just that: to embrace the essence of your own natal chart and penetrate its meaning in a dynamic and immediate way that resonates with your experience of yourself and your life. Not deconstruct it into its component parts which, when interpreted separately, often paint a picture of a fractured, divided soul full of irreconcilable differences! Yes, we all contain all manner of paradoxical contradictions, but we still live as one whole person each day and we need to develop an understanding of a birth chart which reflects that one whole person not its many component parts! There will be no ‘cook book’ interpretations in this course. No ‘you have Jupiter in Capricorn so therefore you’re like this….’. Instead we’ll be looking at the energy of Capricorn, the resonance of Jupiter and the way this combination channels itself through you along with everything else in your chart. As you work through the units you’ll develop an ever deeper appreciation of your chart as a whole. Applying that understanding to yourself and your life will enable you to comprehend your own inner world better and how to best fulfil your potential. As you learn how to do this for yourself you’ll also be learning how to do it for others, enabling you to reach out to friends and family with a guiding hand at times of stress or crisis, achievement or celebration, for astrology has something to say about every moment of life and embracing its messages will always take us deeper and more richly into life’s mysteries. How is the course structured and what’s the time commitment? The course consists of nine units. Completion of each unit should take between four and eight weeks, although some units will take longer than others. The amount of time that you need to devote to the course each week will depend upon a number of factors such as how fast you read or whether you already have some astrological knowledge. However, I would suggest that an average of two to three hours a week will give you a good steady pace for working through the course in the time suggested. This doesn’t have to be in one block of time though. In fact half an hour a day is often better than three hours every Sunday afternoon, because working in regular small chunks keeps your learning ‘on the boil’ and your progress steady. Of course, we all have the best conditions that work for us and you’ll know what they are for you! If you’ve not completed the course within eighteen months of your enrollment an additional coaching charge will be made for any outstanding units at that point, and you’ll be provided with a further six months in which to complete them should you wish to do so. You will be advised of the current cost of this additional fee if you are approaching your eighteen-month anniversary with units still outstanding. The course is conducted on-line via e mail. Course materials include an e book plus course notes in PDF format (approximately 400 pages) and a teaching audio in MP3 format for each unit (totalling 12 hours of audio teaching). You will need to be a fluent English speaker in order to use the course materials and complete assignments. You will also need access to a colour printer to print out copies of your chart and certain parts of the course materials. I am available by e mail to answer any questions that arise as you work through the course content and you will be encouraged to get in touch whenever necessary as it enables me to get to know you better and ensure that you get the most out of the course. Assignments at the end of each unit provide an opportunity for you to work on specific aspects of your own chart and certain third party charts included in the course materials. 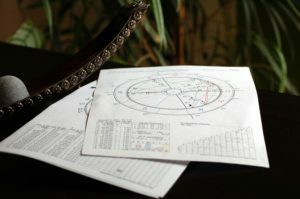 They are submitted by e mail, and I return them to you along with my detailed and comprehensive comments, suggestions of ways to enter into your chart more deeply and tips on applying the principles being studied in ever more revelatory ways. As you work through the course you’ll build up an astrological ‘port-folio’ of your own work on your chart together with my further reflections, suggestions and interpretations. I would also encourage you to journal as you work through the course, as this can enable insights to occur which often remain at the edges of awareness until the pen hits the paper!! Or you may prefer to ‘journal’ through the use of drawing or other artistic modalities. Whatever helps you process the course content and its personal meaning for you is encouraged! For free samples of the written and audio course materials please click here. Please Note: This is a course in astrological interpretation specifically. You will not, therefore, be taught how to calculate and draw up a natal chart from scratch. All charts and data required will be supplied to you with your course materials. This course is suitable for anyone with an interest in astrology. You may know nothing at all or a fair bit already. Wherever you are on the spectrum of knowledge I would ask you to leave what you know at the door and enter into the process of this course with an open mind and heart. You may well discover things you never realised, have old assumptions challenged and learn things that run contrary to mainstream astro-knowledge. That’s because this isn’t just astrology, this is intuitive astrology, and how we apply it to our everyday lives and experiences can shift and change as we do. This is a deeply personal process through which we can discover our essence: not something that can be described to us in a text book!! We use Paypal to process payment. You will be redirected to Paypal’s secure web site to complete your purchase. We do not store any of your payment details through our web site. The fee covers all course materials (400 pages of teaching notes provided in PDF format and 12 hours of audio teaching in MP3 format) and six different copies of your natal chart to work on plus 18 months of coaching, tuition and support from me by e mail. PLEASE NOTE: We will need your accurate time, date and place of birth to draw up your natal chart. If you do not know your time of birth we cannot provide you with accurate charts. Please do not enrol on this course if you don’t know your accurate time of birth. Should you enrol without an accurate birth time your enrollment fee will be refunded minus a £20 admin fee. If you have any questions about the course not answered here, please don’t hesitate to contact us.